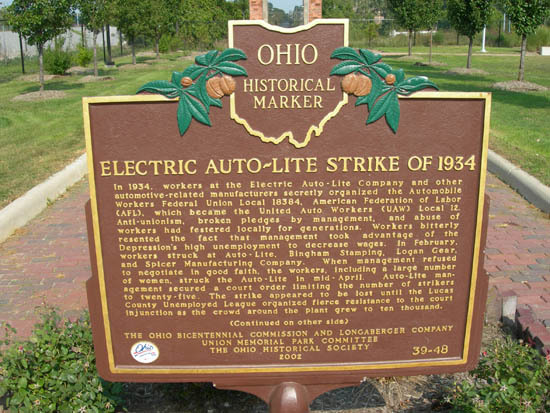 April 12, 1934: the Toledo (Ohio) Auto-Lite strike began with 6,000 workers demanding union recognition and higher pay. The strike was notable for a 5-day running battle in late May between the strikers and 1,300 members of the Ohio National Guard. 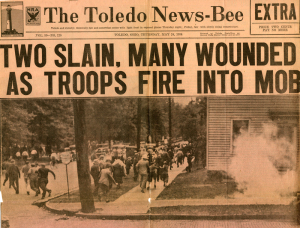 Known as the “Battle of Toledo,” the clash left two strikers dead and more than 200 injured. The 2-month strike, a win for the workers’ union, is regarded by many labor historians as one of the nation’s three most important strikes. 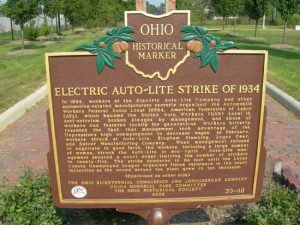 May 23, 1934: at the Toledo Auto-Lite strike, the sheriff of Lucas County (Ohio) decided to take action against the picketers. In front of a crowd which now numbered nearly 10,000, sheriff’s deputies arrested five picketers. As the five were taken to jail, a deputy began beating an elderly man. Infuriated, the crowd began hurling stones, bricks and bottles at the sheriff’s deputies. A fire hose was turned on the crowd, but the mob seized it and turned the hose back on the deputies. Many deputies fled inside the plant gates, and Auto-Lite managers barricaded the plant doors and turned off the lights. The deputies gathered on the roof and began shooting tear gas bombs into the crowd. So much tear and vomit gas was used that not even the police could enter the riot zone. 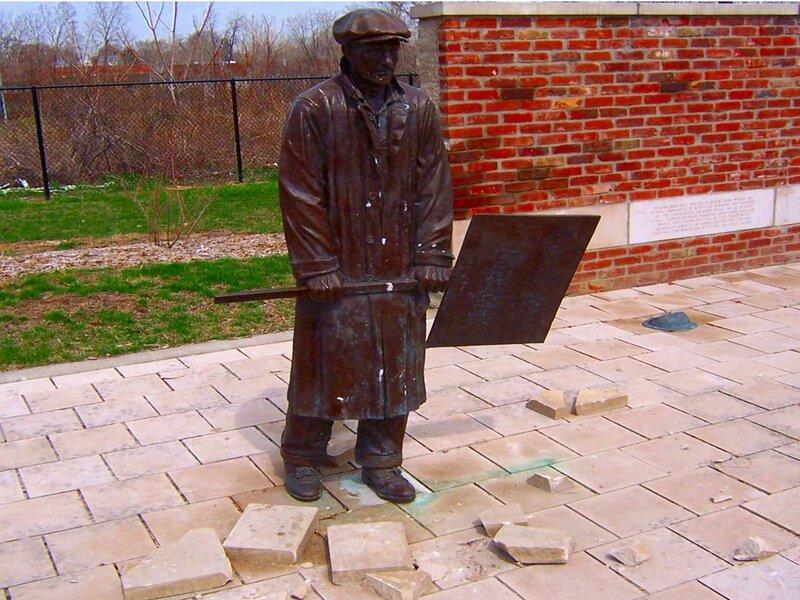 The mob retaliated by hurling bricks and stones through the plant’s windows for seven hours. 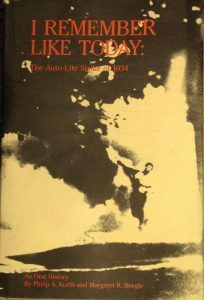 The strikers overturned cars in the parking lot and set them ablaze. The inner tubes of car tires were turned into improvised slingshots, and bricks and stones launched at the building. Burning refuse was thrown into the open door of the plant’s shipping department, setting it on fire. In the early evening, the rioters attempted to break into the plant and seize the replacement workers, security personnel and sheriff’s deputies. 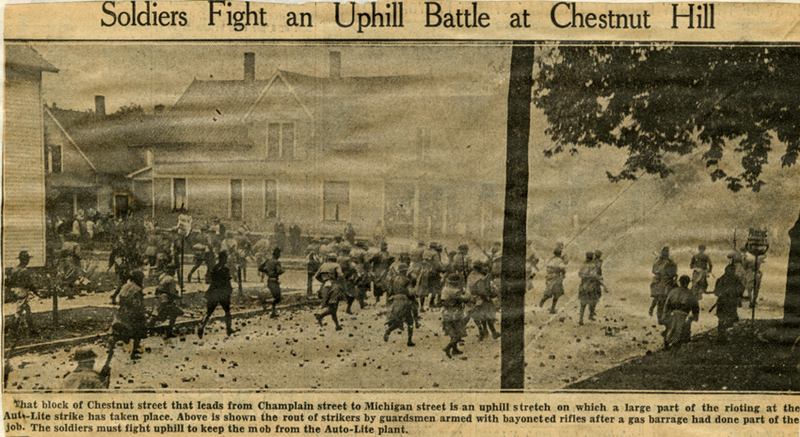 May 24, 1934: Ohio National Guardsmen, most of them teenagers, arrived in a light rain. The troops included eight rifle companies, three machine-gun companies and a medical unit. The troops cleared a path through the picket line, and the sheriff’s deputies, private security guards and replacement workers were able to leave the plant. During the afternoon, President Roosevelt sent Charles Phelps Taft II, son of the former president, to Toledo by to act as a special mediator in the dispute. AFL president William Green sent an AFL organizer to the city as well to help the local union leadership bring the situation under control. May 25, 1934: Auto-Lite officials agreed to keep the plant closed in an attempt to forestall further violence and Auto-Lite President Clement Miniger was arrested after local residents swore out complaints that he had created a public nuisance by allowing his security guards to bomb the neighborhood with tear gas. Strike leader Louis Budenz, too, was arrested—again on contempt of court charges. Meanwhile, rioting continued throughout the area surrounding the Auto-Lite plant. Furious local citizens accosted National Guard troops, demanding that they stop gassing the city. Twice during the day, troops fired volleys into the air to drive rioters away from the plant. 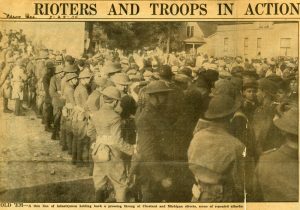 A trooper was shot in the thigh, and several picketers were severely injured by flying gas bombs and during bayonet charges. In the early evening, when the National Guard ran out of tear gas bombs, they began throwing bricks, stones and bottles back at the crowd to keep it away. The AFL’s Committee of 23 announced that 51 of the city’s 103 unions had voted to support a general strike. 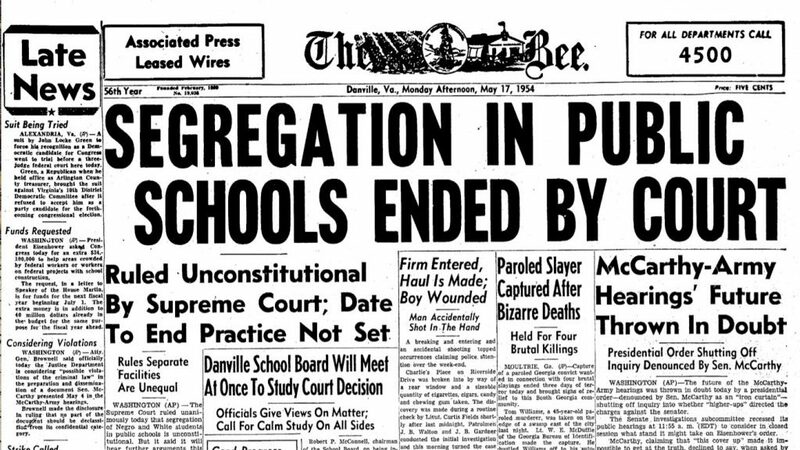 May 26, 1934: the violence began to die down somewhat. Troopers began arresting hundreds of people, most of whom paid a small bond and won release later the same day. Large crowds continued to gather in front of the Auto-Lite plant and hurl missiles at the troops, but the National Guard was able to maintain order during daylight hours without resorting to large-scale gas bombing. During the day, strike leader Ted Selander was arrested by the National Guard and held incommunicado. Despite pleas, Taft refused to use his influence to have Selander freed or his whereabouts revealed. With two of the AWP’s three local leaders in jail, the AWP was unable to mobilize as many picketers as before. Although a crowd of 5,000 gathered in the early evening, the National Guard was able to disperse the mob after heavily gassing the six-block neighborhood. May 27, 1934: almost all picketing and rioting within the now eight-block-wide zone surrounding the Auto-Lite plant ceased. May 30, 1934: the Toledo Central Labor Council asked President Roosevelt to intervene to avert a general strike. The CLC placed the final decision to hold a general strike in the hands of the Committee of 23, with a decision to be rendered on June 2. By this time, 85 of the CLC’s member unions had pledged to support the general strike (with one union dissenting and another reconsidering its previous decision to support the general strike). The same day, leaders of FLU [federal labor union] 18384 met with Governor White and presented their case. The media reported that both Labor Secretary Perkins and AFL president Green might come to Toledo to help end the strike. Despite no resolution to the strike, Toledo remained peaceful. Governor White had begun withdrawing National Guard troops a few days earlier, and by May 31 only 250 remained. June 2, 1934: Auto-Lite and FLU 18384 reached a tentative agreement settling the strike. The union won a 5 percent wage increase, and a minimum wage of 35 cents an hour. 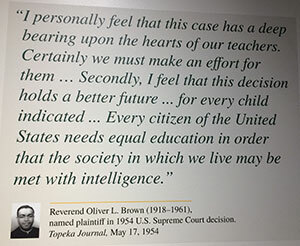 The union also won recognition (effectively freezing out the company union), provisions for arbitration of grievances and wage demands, and a system of re-employment which favored (respectively) workers who had crossed the picket line, workers who struck, and replacement workers. Although Muste and Budenz advocated that the union reject the agreement, workers ratified it on June 3. April 12, 2996: (from the historymike blog) “At the memorial for the old Auto-Lite plant display floodlights have been smashed, a brass picket has been ripped from the hands of the brass striker who held it, and trash is strewn about the site. When I watched Martin Scorsece’s The Last Waltz, I couldn’t believe how many amazing musicians had come to the party. I’d heard of nearly all the performers (surprised about Neil Diamond), but Bobby Charles was unknown to me. “See You Later Alligator”? Bobby Charles wrote it. 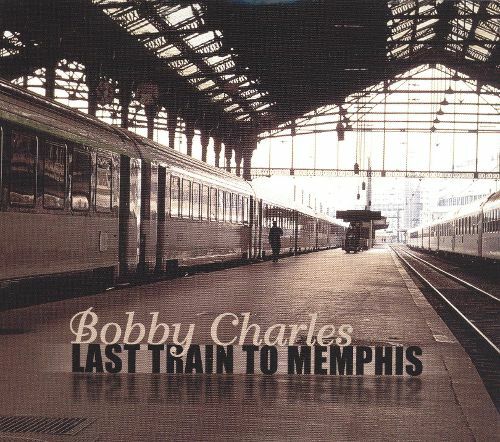 One of my favorite singles was Fats Domino’s “Walking to New Orleans.” Bobby Charles, again. The song he did do (“Down South In New Orleans“) was on the released soundtrack, but not featured in the movie itself. A video-taped outtake of his “Down South In New Orleans” exists. Unfortunately for Charles, it’s Levon Helm’s voice that mainly heard. Perhaps a reason for the song’s exclusion? Or perhaps the brighter starlight of Louisiana compatriot Dr John who had preceded Charles in the show (“Such A Night”) and stuck around for Down South. 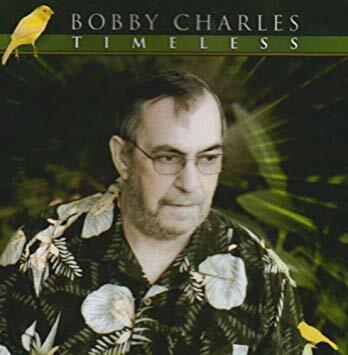 Robert Charles Guidry was born in Abbeville, Louisiana and thus it is no surprise that he grew up listening to Cajun music. He had written “See You Later” for his idol Fats Domino, but Fats didn’t do alligator songs. Charles ended up singing the song over the phone to Leonard Chess, of Chess Records in Chicago. Heard, but unseen, Chess sent a airplane ticket to Charles. Though a successful songwriter, a jealous wife and a dislike of touring kept him off the road. When a divorce eased that issue a bit, a pot bust in 1971 put him on the run rather than be jailed. Where did he end up? A place called Woodstock, NY. A place he’d never heard of, not even the festival. I suppose it’s hard to be a musician in Woodstock and not run into others in the business. Fortunately for Charles, he ran into Albert Grossman, the manager of, among others, Bob Dylan and Janis Joplin. Here’s the track list. 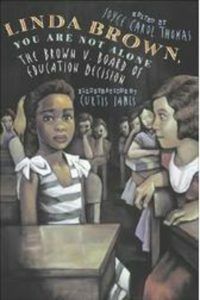 Click on a title for a sample. Unfortunately, but not surprisingly given Charles’s track record, the album did not sell. He eventually left Woodstock and returned to Louisiana. And I guess we all can figure out now his Last Waltz invitation in 1976. He didn’t stop writing. 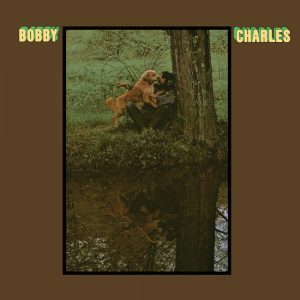 In 1976, Joe Cocker covered Charles’s The Jealous Kind. So did Ray Charles and Etta James. He did release more albums with equal outstanding quality and equal non-commercial success. 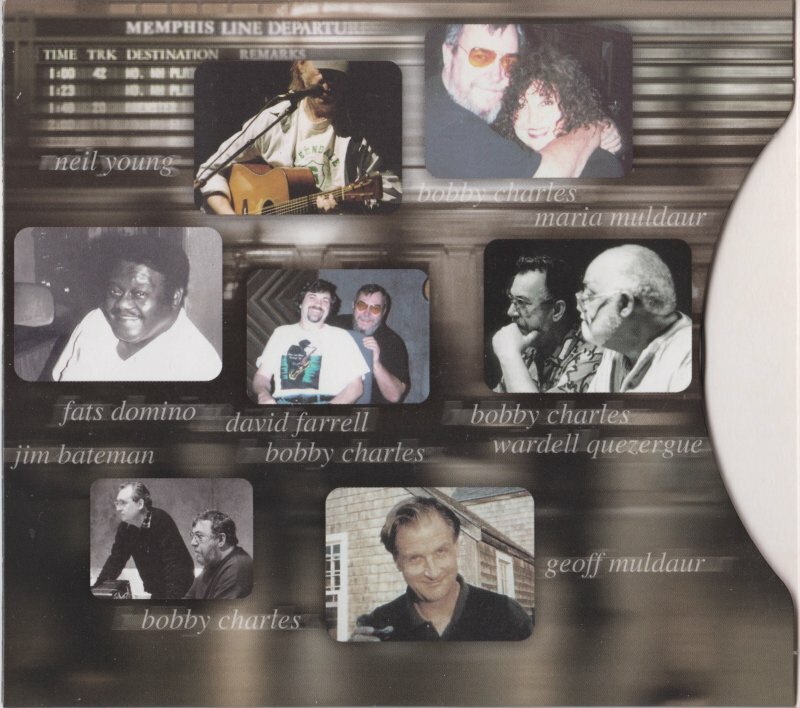 In 2004 the double CD Last Train to Memphis was a retrospective of his compositions, with guest appearances by Neil Young, Willie Nelson and Fats Domino. On September 24, 2005, Charles lost his home to Hurricane Rita when it struck southwest Louisiana. In October 2007, he was inducted into the Louisiana Music Hall of Fame in 2007. The site has a great summary of his life and music. Among that summary, is the amazing fact that Charles neither played an instrument nor read or wrote music. By the early 2000s he was in poor health with diabetes and was in remission from kidney cancer. He died on January 14, 2010. He was 71.